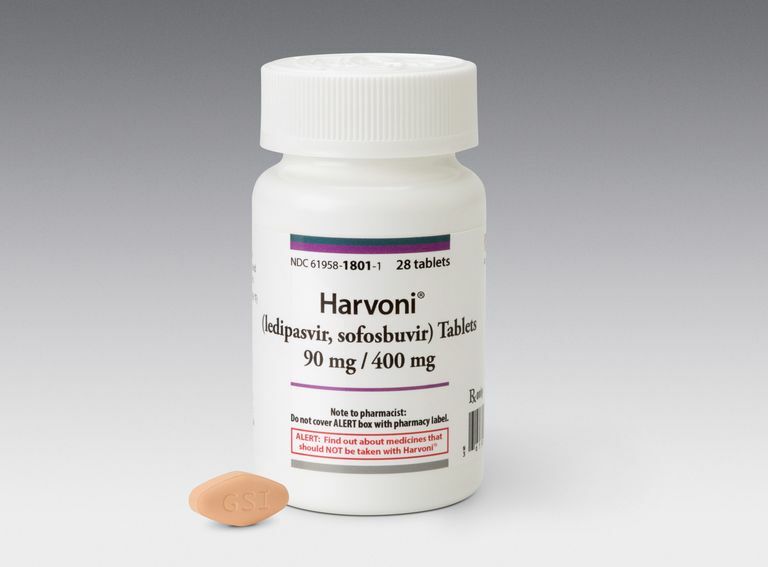 Harvoni is a fixed dose combination drug used in the treatment of chronic hepatitis C (HCV) infection. The two drugs that comprise Harvoni (ledipasvir, sofosbuvir) work by blocking both a protein (NS5A) and an enzyme (RNA polymerase) vital to the replication of the virus. Harvoni was approved in October 10, 2014, by the U.S. Food and Drug Administration (FDA) for use in adults 18 years or over with HCV genotypes 1 infection, including those with cirrhosis. Harvoni is approved for use in previously untreated ("treatment-naïve") patients, as well as those with partial or no response to prior HCV therapy ("treatment-experienced"). Harvoni is the first FDA-approved HCV drug that does not need to be taken with either pegylated interferon (peg-interferon) or ribavirin (two drugs traditionally used for HCV combination therapy, both of which had high toxicity profiles). Harvoni is reported to have cure rates of between 94% and 99%, while Phase II trials have reported a 100% cure rate in patients coinfected with HIV and HCV. One tablet (90mg/400mg) taken daily with or without food. Harvoni tablets are diamond-shaped, ginger-colored, and film-coated, with "GSI" embossed on one side and "7985" on the other. Additionally, an 8-week course can be considered for treatment-naïve patients without cirrhosis who have an HCV viral load of under 6 million copies/mL. Other possible side effects (under 10%) include nausea, diarrhea, and insomnia. There are no contraindications for the use of Harvoni in patients with HCV genotype 1. However, for patients with HIV using the drug tenofovir (including Viread, Truvada, Atripla, Complera, Stribild), extra care should be given in monitoring for any tenofovir-associated side effects, particularly renal (kidney) impairment. Antacids should be taken separately 4 hours before or after a Harvoni dose, while dosages of proton pump inhibitors and H2 receptor inhibitors (a.k.a. H2 blockers) may need to be reduced in order to prevent decreasing ledipasvir absorption. While there is no contraindication for the use of Harvoni in pregnancy, little human clinical data is available. However, animal studies into the use of both ledipasvir and sofosbuvir have shown no effect to fetal development. Specialist consultation is recommended during pregnancy to assess the urgency of Harvoni therapy, specifically whether to start immediately or to wait until after delivery. It is recommended that all women of child-bearing age be monitored monthly for pregnancy during the course of therapy. It is also recommended that the patient and her male partner be provided at least two non-hormonal methods of contraception and that they be used during the course of therapy and for six months afterward. U.S. Food and Drug Administration (FDA). "FDA approves first combination drug to treat hepatitis C." Silver Spring, Maryland; press release issued October 10, 2014. What Is a Viral Load for Hepatitis C?